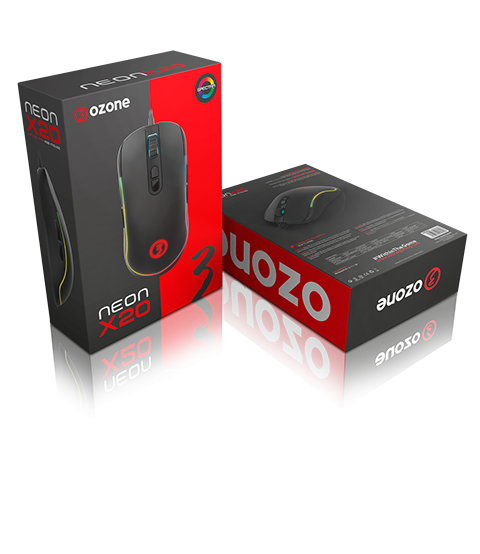 The Neon X20 touches down at Ozone, the result of the evolution of a range subject to constant examination by the real video games experts. It combines an advanced optical sensor (Pixart PMW3325) with an ambidextrous and versatile design that houses the highest performance features, in order to become your best ally in competition. Equipped with advanced technology and high quality materials, the Neon X20's priority is to shadow your every movement, guaranteeing you speed and control in every move thanks to its optical sensor, which offers a refresh rate of up to 1000Hz and reaches a sensitivity of up to 10,000 DPI per software. In addition, you'll be able to switch between 6 levels of DPI on the fly, assigning the value you prefer to each level, so you can adapt different strategies to each game. A mouse that adapts to any type of game thanks to its ergonomic and ambidextrous design, with a rubber finish that offers comfort and a soft touch during long gaming sessions, and that, in addition, perfectly suits both left-handed and right-handed users. In addition, the Neon X20 is manufactured exclusively with premium materials and features a braided cable that guarantees greater resistance to wear and tear. Create different lighting effects thanks to the 16.8 million colors offered by RGB Spectra lighting, with which even the speed and intensity of the illumination can be customized, to make your gaming sessions a truly authentic experience. The Neon X20 features 9 configurable buttons which can be used to create macros and keyboard shortcuts, assigned through its powerful software. Get the most out of your mouse and customize your every movement.